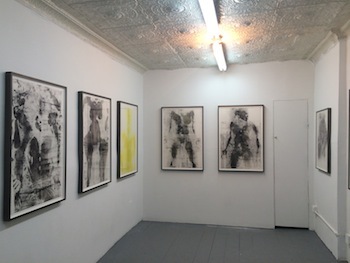 Keltie Ferris has just opened a stunning exhibition of "body prints" at Chapter NY in the Lower East Side. These intimate works were created by pressing her oiled body, clothed and unclothed, against paper on the studio floor and then dragging powdered pigment along the paper, revealing her imprint. The result are sensual images of the artist's flattened three-dimensional form that suggest photo processes and x-rays, while also evocatively resonating with art historical allusion that touch on many art figures. The performance works of Yves Klein come immediately to mind, as do the paintings and reliefs of Jasper Johns, the body prints of David Hammons and a wide range of feminist works including Ana Mendieta, Louise Fishman (the "Angry" paintings) and Janine Antoni. These body prints by Ferris feel powerfully their own and integrally connected to the artist's very physical painting practice. And Chapter NY's shoebox-size, less-than-200-square-foot space [Simon to confirm exact dimensions with dealer] heightens the intimacy of the works by almost literally pressing the viewer close to the works themselves. Viewing the exhibition was an immersive experience that reminded me of my visit, six years ago, to the artist's painting studio at Yale, an equally small space that was chock-a-block with paintings, affording a view of powerful, eight-foot-tall canvases within a narrow, six-foot-wide passageway -- and the experience also reminded me of several other, equally immersive exhibitions, distinctly body-relational, that are on view around New York at the moment. Visiting David Altmejd's Juices exhibition is like walking through a 3-D, stop-action movie of werewolves, black plaster figures, bird men, heads, smashed mirrored panels and explosive projectiles of resin fruit -- in other words, thrilling fun. Seen in three diminishing scaled rooms, you move from the operatically baroque to a final room of a single Hellenic-like, poignant double bust with a single eye looking skyward. Kon Trubkovich's Snow is a meditation on memory, featuring a group of paintings and a short film installation edited from hours of the artist's old family footage, shot before he emigrated from the USSR. The footage was marked, painted and collaged, and is presented with the accompaniment of a hauntingly gentle soundtrack that creates an immersive experience that makes you feel like you're sitting inside a snow globe. This elegant six-artist group show -- featuring one work each by Katharina Fritsch, Robert Gober, Jasper Johns, Ellsworth Kelly, Martin Puryear and Charles Ray -- is linked by an almost surrealist minimalism. Beginning with the foot print in Jasper Johns's new, double-sided copper relief entitled 0 - 9, which depicts the artist's now-iconic numerals in two stacked rows, and moving on to the smoke-like, spiraling stem of Martin Puryear's black "gourd" sculpture, to the haunting second room containing Gober's giant butter in a crib and Katharina Fritsch's hypnotic dragon-slaying Michael sculpture in turquoise -- this is a must-see show.